Le Club AccorHotels has launched a new promotion for stays at Adagio, Mercure and Novotel brands in Brazil. Members can earn double points for stays consumed for stays between January 30 – March 1, 2018, if booked January 30 – February 28. Note that it is unclear if you can earn this bonus only once or multiple times. There are more Le Club AccorHotels affiliated hotels in Brazil now that the conversion of former Tulip hotels is completed. I am actually on my way to Brazil for three weeks, but haven’t decided yet if I will stay at any Accor properties while there. 1. The Le Club AccorHotels general terms and conditions apply to the 7895 Le Club AccorHotels offer and, for you to benefit from it, you must be an associate Le Club AccorHotels. 2. In order to take advantage of this offer, the member of the Le Club AccorHotels loyalty program must compulsorily subscribe to the offer (between 01/30/2018 and 02/28/2018) by clicking the “CONNECT” button above and following the instructions. 3. 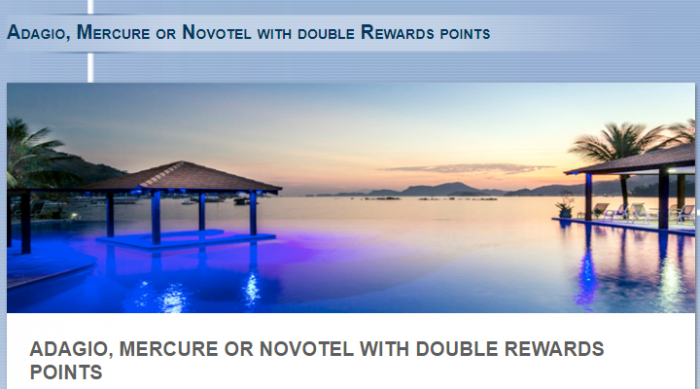 This offer allows Le Club AccorHotels associates, regardless of their status, to accumulate 2X more Rewards points in a hotel held at one of the 7895 Le Club AccorHotels participating hotels. The Rewards points for this offer are offered in addition to the Rewards points and Status points that are already accumulated by the program members for each eligible accommodation made by them in accordance with the general terms and conditions of Le Club AccorHotels, and is calculated according to points accumulated by an associate with Classic status. This promotion does not apply to Le Club AccorHotels Independent Hotels. 4. This offer is valid for a lodging from 01/30/2018 until 01/03/2018 in one of the hotels participating in the program in Brazil, which has been booked between 01/30/2018 and 02/28/2018. 6. Any consecutive accommodations (check-out and same-day check-in) at the same hotel will be considered as a single stay. This only lodging will be valid once for the offer 7895 Le Club AccorHotels. 14. We request that you indicate the following reference: 007895 in all communications with AccorHotels customer service related to this offer. Previous articleThe Guardian: Vueling Refuses To Compensate Passengers More Than 50 EUR For Destroyed Suitcase Repair – But Can They Really?